Topaz, one of the 20 rescued cats. 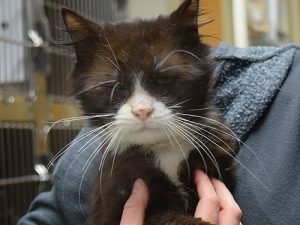 An elderly couple in Portland’s St. John’s neighborhood breathed a sigh of relief last Friday when OHS removed 20 cats and kittens from their home and brought them to OHS for medical care and eventual adoption. What started with just a few cats many years ago turned into a large colony of cats, as the felines reproduced and stray cats came and went through an open basement window. The homeowners were facing major issues of their own, as their decaying home’s electrical and plumbing problems were forcing them to relocate. The cats rescued last Friday were being fed by the owners, but nearly all were in need of medical care that the couple could not afford. The OHS Holman Medical Center is now treating the cats for hair loss, eye infections and dental problems. Turquoise, another rescued cat now at OHS. “Everyone who had helped us has been very caring and considerate,” said one of the owners of the cats. “Don’t be afraid to reach out for help,” she advised other people who might be facing a similar situation. 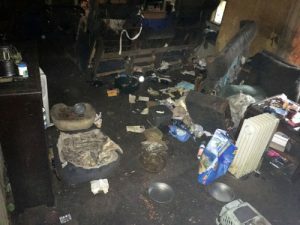 Inside the house where the cats and the elderly couple were living. The arrival of the 20 cats comes as OHS is nearly at capacity for cats—especially older cats. 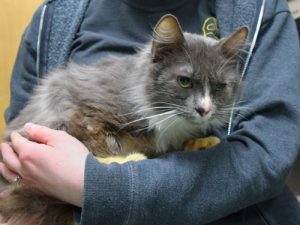 OHS is currently providing care for more than 125 cats, more than two-thirds of which are older felines who typically take some time to be adopted. While there are no time limits on how long pets stay at the shelter, OHS is encouraging potential cat adopters to visit the shelter now. “If you have been thinking about adopting a cat, now is a great time to meet your new furry soulmate,” said Dr. Otteman. It’s sad but I can see how it could happen. We are fortunate people who care at the Oregon Humane Society are there to help. Thank you OHS for helping the couple and the kitties! Yay, I love that you do this! That’s why I don’t donate anymore…..manipulative propaganda.